Nowadays finding a job in any place has become a very difficult task indeed. All big companies in the world, over rely heavily on technology nowadays and that is why they do not hire so much manpower on-board. Rather than hiring many average people to get the job done, they prefer to hire just a few exceptional people on to their team so that things can be done in a more effective manner. If you wish to work in Germany, then there are some special ways in which you need to go about finding a job. If you go about things in the wrong way, then that could spell disaster for you. 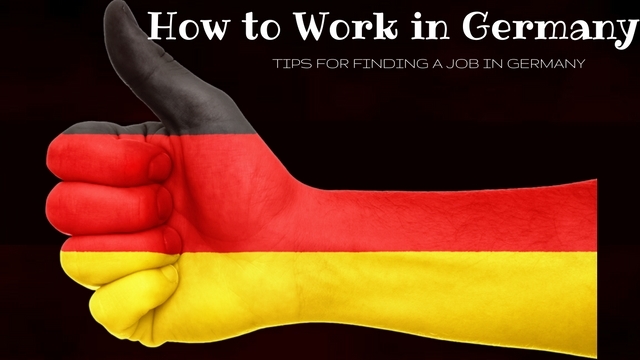 Finding a job in Germany is something which is not known to be an easy task at all. Finding a job in any place is a challenging thing, but it is especially challenging in Germany because everyone is so good at what they do. Germans are known as extraordinary workers all over the world and they deliver perfection at all costs. So if you are unwilling to do your bit at every stage, then you cannot expect positive results out of your job search. In the course of the job search, you will be tested physically, mentally as well as emotionally but you must take it all in your stride if this is something which your really do want to do. Once you have applied to a company and done everything as per the protocol, then all you can really do is wait for your turn. There is so much you can do when it comes to searching for a job, but once you have done your bit, you should really leave it up to the company which you have applied to. No matter how desperately you would like to have a job, you should not act desperate under any circumstances. No big companies like it, when the job seekers act in a foolish manner, hovering around the company premises waiting to hear good news immediately. Just because in your country things are done super fast, that does not mean that in Germany too the same procedure is followed when it comes to job searching. Germany has its own way of going about things and doing a screening of potential employees. The moment you appear impatient or try to fight the system, you will seem as someone who is very impatient and unprofessional. Under no circumstances should you let the recruiters have such an impression of you. The moment you give respect, you will also receive tremendous respect as well. Since you have been warned adequately above, that patience is something which is the key when it comes to finding a job in Germany, you can always make use of the extra amount of time in order to brush up on your own job skills as well as technological knowledge. People in Germany are very smart, so to avoid looking like a fool in the course of an interview, you should make it a point to always be at the top of your game. Use this extra time, as a chance to catch up in areas which you have been lagging behind. Things in Germany are by no means disorganized or corrupt, so you do not have to worry. Being realistic is something which is key when it comes to looking for work as well as finding a job in Germany. Once you start fooling yourself and building castles in the air, things will only go downhill for you. No matter what transpires, you must remain positive at all points in time, but ensure that in the course of being very positive you do not end up becoming unrealistic. No company is going to hire you if you come across as someone who is not practical and unwilling to see things as they really are. German companies have no place for people who are both naïve and childish. In most parts of the world, if you know English that is more or less enough. In Germany however things are rather different. Knowing the language German is very important If you wish to get a good job. If you are not fluent and acquainted with the language then you will not be able to take part in discussions which are taking place in the workplace. Most companies prefer to hire people who are fluent in German, so as to avoid any kind of confusion or even miss communication. If you do not know the language then it is advisable that you get a tutor immediately. Many people, who are not getting jobs in their own homeland, migrate to Germany thinking that everything is very easy and nice here, but this is certainly not the case. Living in Germany is not merely difficult but also rather expensive. If you have come here seeking work, then ensure that you have some savings with you, in order to back you up. If you do not have any savings to fall back on, then things will become immensely tough for you in a short span of time itself. If you want to wait for a good job to come along for you, then be sure to have some savings which will help you during this tough time. It is rather unfortunate indeed that there are a number of individuals who think that they need to get a good job right from the onset. When it comes to working and finding a job in Germany, please take note that there is simple no shame in starting from the bottom and then steadily making your way to the top. There is immense dignity of labor in Germany and everyone is respected. In fact people who make it big on their own steam are respected even more than those who are born into very rich families. If you have negative thoughts like this which is preventing you from taking up jobs, then remove it from your mind immediately. The German race is known for their many positive attributes but it is rather unfortunate that they are not exactly known to be very friendly. Though there are certainly many exceptions to the rule, but do not expect that you will go over there and a number of people will come helping you and trying to assist you along the way. Though the locals are rather agreeable, in Germany people do not like to get too involved in other peoples business. Everyone is very much involved in their own business and work. So be willing to do it all on your own without help. When you come to Germany seeking a job, do not limit yourself to getting just one job. Most Germans are very good at multi tasking and they pick up at least two jobs in order to help them make two ends meet. It is always nice to have some extra money to put into savings and in this very split you too should try and take up two jobs. Things might be very tiring indeed, but over time you will certainly get very used to it. If one of your jobs is very tiring then try and take up a second job which is not so tiring and difficult. The harder you work, the better your standard of living will be. In most parts of the world, working in a startup company is something which is not looked upon very fondly. However in a place like Germany where the number of jobs are very limited, there are many people who do very well, once they apply to startup companies for work. As long as you get some experience and are earning a salary, you need not worry too much. Ensure that you have a well written CV and that in itself will be hard the job done for you already. Startups have a lot of potential in Germany and they offer good money as well. In this day and age, all of us have access to the computer. Even those who do not have access to a computer can always make use of their smart phones as well as laptops. So if you are someone who has access to the computer, then you should make it a point to make much use as you can of the internet. With just a click of a button there is so much information at our disposal today, so you too must be willing to do your bit by browsing the web for hours on end. The harder you search, the better the job you will be able to find. You can also search in the newspaper for job ads. If you simply cannot find a job in any company, then you can always start freelancing. If you freelance, you will not merely be building your own contacts but you will also be earning money for yourself. Freelancing is certainly not as easy as it sounds and it requires round the clock attention and focus. Only start freelancing if you are really serious about it. If you are unwilling to give your 100% then shy away from taking up this option. Once you are sure about your own talent and ability, you should not let anything stand in your way. Success comes to those who work very hard. As it has been mentioned above, Germany is a place which has strict protocol when it comes to job searching. So rather than being confused about how to go about things, it is advisable that before you start things off, you acquaint yourself with how things are meant to function. The best way to do this is by asking someone who has been through a similar situation as you have. If you are from abroad there is no point in questioning someone who has been born and brought up on German Soil. Be sure that you act in a smart way at all times, because the Germans are known to be exceptionally shrewd. The world is very well connected toady in the 21st century. However if you are trying to bag a job in Germany, be sure that you are there in Germany. There is no point applying from overseas, because people who are there in Germany at the moment are given the first preference. These are just some of the chief things which you need to keep in mind as well as do if you are trying to find a job for yourself in Germany. The German population are very talented as well as responsible so if you are someone who is planning to migrate from abroad, it is very important that you are willing to give it your best shot right from the onset. As long as you are exceptional at what you do and are a diligent worker, you will surely be able to seek employment in any company. Accept that things will take time and sooner or later everything will fall into place for you.